Calcutta 4 is the name of an accession of Musa acuminata ssp. burmannica grown at the Imperial College of Tropical Agriculture (ICTA) field collection in the West Indies from a sample of seeds received in 1931 from the Calcutta botanical garden. According to Ernest E. Cheesman, who was working at the ICTA at the time, the material originally came from Burma (today's Myanmar). Cheesman adds that in 1938, the ICTA received from a silviculturist in Burma two clones, Tavoy and Long Tavoy, which he describes as nearly identical to each other and Calcutta 4, except for small differences in quantitative characters such as bunch size and fruit length. In 1962, FHIA obtained Calcutta 4 from ICTA and gave it the code IV-9 in its germplasm collection. Calcutta 4 has been used extensively in breeding because of its resistance to black leaf streak. It is also resistant to sigatoka leaf spot, several races of Fusarium wilt and partially resistant to Radopholus similis and other nematodes. Calcutta 4 has a small non-parthenocarpic bunch, weighing less than 2 kg. Calcutta 4 is considered highly resistant to Mycosphaerella fijiensis , though it was attacked by several isolates of the pathogen in some experiments. Calcutta 4 did not show any rhizome discoloration at harvest in plots containing Fusarium oxysporum f. sp. cubense race 1 (VCG 0124) and race 4 (VCG 0120, 0129) in subtropical Australia. Calcutta 4 has moderate to good resistance to Radopholus similis. Calcutta 4 has been used in many breeding programs, because of its resistance to black leaf streak. In Honduras, many crosses were made between different bred diploids and Calcutta 4 to attempt to produce resistant hybrids with improved bunch features. SH-2989 was selected out of these crosses, because of its resistance to black leaf streak and better bunch characteristics than Calcutta 4. Out of further crosses of SH-2989 with improved diploids, SH-3437 was selected, which is highly resistant to black leaf streak and has a bunch weight of up to 35 kg, and is one of the parents of FHIA-20. 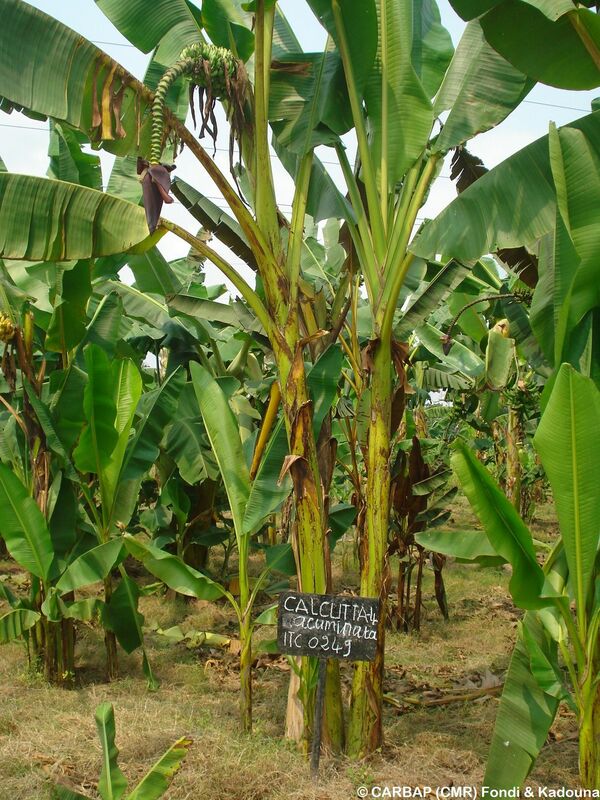 Calcutta 4 is also the male parent of black leaf streak-resistant tetraploids bred by IITA, such as the plantain-like TMPx 6930-1. Calcutta 4 (ITC0249) is recommended for evaluation trials as a highly resistant reference to black leaf streak . It has been used as such in IMTP trials. 1. Kew's World Checklist of Selected Plant Families considers Musa acuminata var. burmannicoides to be a synonym of Musa acuminata ssp. burmannica. 2. Page 27 in Cheesman, E.E. 1948. Classification of the bananas. III. Critical notes on species: Musa balbisiana. Kew Bulletin(1):11-28. 4. E. Fouré, unpublished, cited by Jones, D.R. (ed.). 2000. Diseases of banana, Abacá and Enset. CABI Publishing, Wallingford, Oxon (GBR). 544p. 5. Mobambo, K.N.P., Pasberg-Gauhl, C., Gauhl, F. and Zuofa, K. 1994. Early screening for black leaf streak / black Sigatoka disease resistance under natural inoculation conditions. Infomusa (FRA) 3(2):14-16. 6. Fullerton, R. and Olsen, T.L. 1995. Pathogenic variability in Mycosphaerella fijiensis Morelet, cause of black Sigatoka in banana and plantain. New Zealand Journal of Crop and Horticultural Science 23(1):39-48. 7. Pegg, K.G. 1999, unpublished, cited by Jones, D.R. (ed.). 2000. Diseases of banana, Abacá and Enset. CABI Publishing, Wallingford, Oxon (GBR). 544p. 8. Fogain, R. 1996. Screenhouse evaluation of Musa for susceptibility to Radopholus similis: evaluation of plantains AAB and diploid AA, AB and BB. p.79-86. In: Frison, E.A., Horry, J. and De Waele, D. (eds.). Proceedings of New Frontiers in Resistance Breeding for Nematode, Fusarium and Sigatoka, Kuala Lumpur (MYS), 1995/10/2-5. New frontiers in resistance breeding for nematode, Fusarium and Sigatoka. INIBAP, Montpellier (FRA). 9. Ortiz, R. and Vuylsteke, D. 1994. Plantain breeding at IITA. p.130-156. In: Jones, D.R. (ed.). Proceedings of First Global Conference of the International Musa Testing Program, La Lima (HND), 1994/04/27-30. The improvement and testing of Musa: a global partnership. INIBAP, Montpellier (FRA). 10. Carlier, J., De Waele, D. and Escalant, J. Vezina, A. and Picq, C. (eds.). 2002. Global evaluation of Musa germplasm for resistance to Fusarium wilt, Mycosphaerella leaf spot diseases and nematodes: in-depth evaluation. INIBAP Technical Guidelines. INIBAP, Montpellier (FRA). 63p. 11. Jones, D.R. and Tézenas du Montcel, H. 1994. Final report for UNDP/World Bank on the results of the International Musa Testing Programme (Phase I). INIBAP, Montpellier (FRA). 462p. 12. Orjeda, G. (compiler). 2000. Evaluating bananas: a global partnership. Results of IMTP Phase II. 466p. List of Calcutta 4 accessions in MGIS. Page last modified on Wednesday, 03 January 2018 16:47:53 CET by Anne Vézina.